Readers will never feel the same about the occasional ringing in their ears. Did President Kennedy know there was an alien plot? Was it the Pope who divulged the information to a young United States President? Was the Pope in support of the plot to enslave humans, or did he place our president in grave danger when he enlisted John F. Kennedy’s help to stop it? Have You Met the Grays? 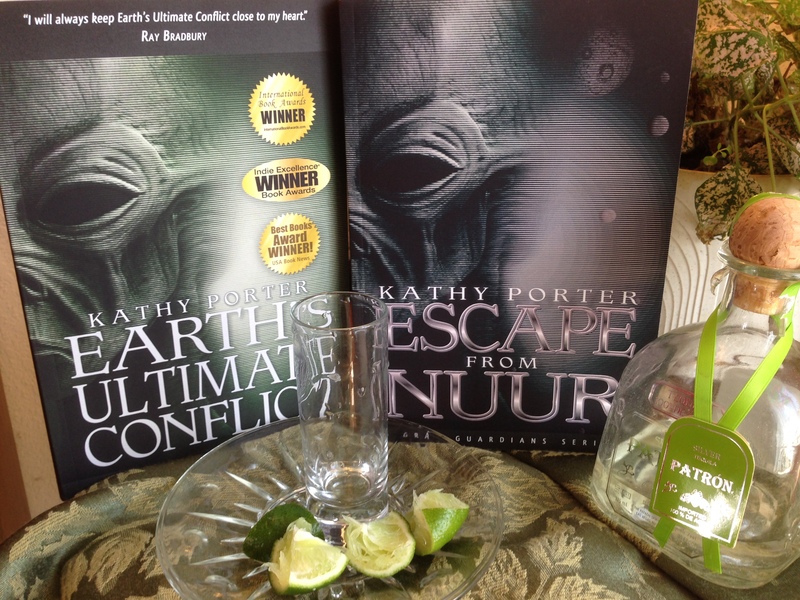 “Kathy Porter’s debut series, “Earth’s Ultimate Conflict”, introduces us to the existence of alien life forms from other solar systems. Humanity’s worst nightmare is coming true! The planet is stricken by natural disasters; thousand of people become ill; Earth’s crust shakes with seismic activity and the swirling currents in the atmosphere reach hurricane force. ““Escape From Nuur” is a first-rate story, bursting with inter-galactic action, plausible anxiety, budding romance, and subtle humor. The characters develop realistic and believable inter-species relationships while working together. Porter has painstakingly crafted an easily visualized setting for the story, making the ‘mental movie’ quite detailed and entertaining. Although fictional, at times the events and situations in this book are so vividly portrayed it is easy to forget they truly are a figment of Porter’s brilliant imagination. Sequel to book one, “Earth’s Ultimate Conflict”, “Escape From Nuur” will soon be followed by book three in the series, “The Journey”, will be available soon. Fans of Sci-Fi will not want to miss this series. Readers will never feel the same about that occasional ringing in their ears! Would You Leave Earth With Aliens? I have often wondered if I were given a choice ~ would I allow aliens to take me? I have imagined a spacecraft landing just steps from my front door and offer to show me their planet and tour the galaxy. My answer would be yes, after I asked a few questions. Where is your planet? Is it in our solar system? If not which arm of our galaxy? Or is it in another galaxy? Can I survive in your atmosphere? How long will it take, and what will my food substance be? How long will I stay? Do you eat humans? Now that last one is strictly coming from the “To Serve Man” episode of Rod Serling’s Twilight Zone, which terrified me as a child. Should I ask such a question? Of course! You need to ask to be certain you will have a safe flight, right? Since the history of mankind there has been a belief in the “Sky People.” Almost every country on Earth has found pictures in caves or ornate pyramids, and other structures built to honor them. Aliens are part of our history that can’t be denied. Did aliens come and build great civilizations and then leave Earth for another planet? Or were the civilizations already here and cultivated by the aliens then taken? Were our human ancestors asked to leave with them or taken by force? Some books require more than a cup of tea or coffee to read. Are Sci-Fi Writers, Inventors and Scientists the Holy Trinity of Future Creations? When I write and create new worlds and invent new structures, modes of travel and other inventions I vividly see them, know them, and understand them nearly instantly. I can give other planets wonderful useful fantastic creations because I make them up as I write ~ or do I? From the beginning of the Gray Guardians Series I felt compelled to tell my stories and I created different very unusual beings, objects, and worlds in my mind. I often speak about how my stories, new worlds, and inventions download into my mind. It has me thinking about all our wonderful science fiction writers of the past whose books placed us on the moon, in orbit, sent us to Mars, gave us robots, wormholes, warp speed, flying cars, communicators, etc. Many of their written creations are now part of our life today. If they hadn’t first been created in the mind of an author would they have happened? Is the creation of a science fiction novel, jam-packed with new ideas and human abilities the catalyst for actual creation? Seems that way. Would the scientists, or inventors have thought of these things themselves? Or was it an unexpected creative collaboration of one minds idea and another’s ability to make it so ? I ask all you inventors and scientist out there, if you could please find a way to create the Biotent brought to Earth by the Grays, in my novel Earth’s Ultimate Conflict? The applications for its use and ability to save lives are boundless. A Biotent would be the ultimate Prepper necessity for a future apocalypse. A dome shaped organic covering which creates its own environment, isolating humans or other entities within its protection from external threats. Biotents regulate their own growth (expansion and contraction) and internal environment depending on the needs of the life forms within its shelter. And, by the way if you do invent a way to make Biotents ~ please don’t forget to give one to me! You are currently browsing the archives for the Apocalypse category.